The news media on June 23 reported that the Trump administration has directed the creation of tent cities on military bases to house the 100,000 migrants it has already arrested and expects to arrest at the southern border. Many of these migrants, fleeing violence at home, have used established procedures to request asylum but have been arrested instead. President Trump has publicly called these people “animals,” saying, in effect, that they are subhuman. Talk about blaming the victim. In some of his most ugly remarks, the president, in a televised White House ceremony, presented the so-called “Angel Families,” the loved ones of Americans killed by undocumented residents, fully intending to amplify his contention that all migrants are dangerous criminals in waiting. In blaming the migrants, he has made his followers the victims. The Angel Families’ stories are heartbreaking, but ABC News has reported that the president, in his remarks to the families, cited suspect figures extracted from a flawed 2011 government report on crime rates involving migrants and used the figures to concoct his own statistics. He has done so repeatedly, blaming the migrants for crimes they have never committed. 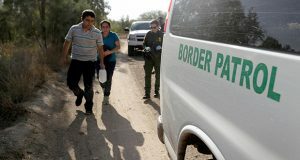 In November 2016 The Washington Post reported that the figures were “misleading and lack context.” In addition, a University of Wisconsin study by criminologist Michael Light, who analyzed figures from 1990 to 2014, found that “undocumented immigration does not increase violence.” Rather, crime decreased when the number of immigrants was factored in. Now, thousands of migrants have been arrested, with many children being separated from their families. The president’s executive order did nothing for those already seized and promises only to keep together families in the future, not to stop arresting them. Nor does it end the current rote trials that are dooming thousands of the migrants to summary deportation. On Monday the president called for the complete elimination of judicial processes for the migrants. It is not hyperbole to say, much as we may be reluctant to do so, that history is repeating itself, albeit on a smaller and non-lethal scale than in World War II Europe when Jews and others were deported to concentration camps. Now it is the Spanish-speaking children already separated from their parents who are being loaded onto planes or being spirited away in vans in the dead of night to camps and shelters whose locations are often kept secret from civic officials. Other facilities, whose locations are known, are closed to not just the press, but, often, to lawmakers. We should have seen this coming. In his first TV interview after being elected, on “60 Minutes” on November 13, 2016, President Trump said he would “immediately” deport “2 million —it could even be 3 million”—undocumented residents. “We are getting them out of the country,” he said, or “incarcerate them.” He said nothing of due process. These migrants are the victims of what could best be described as frontier justice. Blaming them for their plight—demonizing them — serves only to normalize the xenophobia the president is fomenting for his own partisan purposes. — Martin W.G. King often writes commentaries on social issues, including homelessness and capital punishment. Deport them all. They come from some of the most corrupt countries in the world and they bring that corrution with. A perfect fit for corrupt Democrats. Thanks for this article. I see it doesn’t discuss Trump’s motivations, or the distractions from more important issues that immigration provides. I’m not a fan of Mr. Trump but you seem to overlook the not insignificant fact that he is dealing with ILLEGAL entry to the U.S. So, those living here illegally are just “undocumented residents”. So, does that mean that I could break in to this guy’s house (or anyone on the left), and reside at there homes? Sleep in their house, eat their food, shower and wash my clothes there without being invited? Would I be considered an undocumented resident? Or, would I be arrested for breaking and entering and theft?